LBRY apps rely on blockchain technology and the LBRY Credits (LBC) cryptocurrency in order to participate in the network. 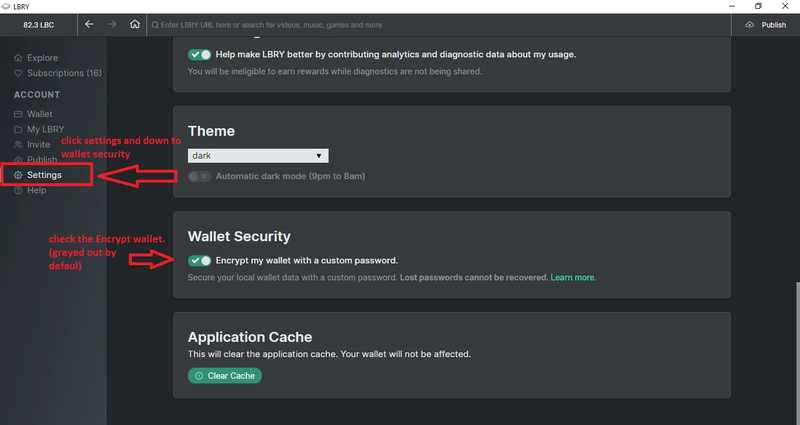 These LBC are stored in a wallet (data file on your PC) which is generated with each user's LBRY installation. Wallets contain your funds, channel data, and claims (any uploads). 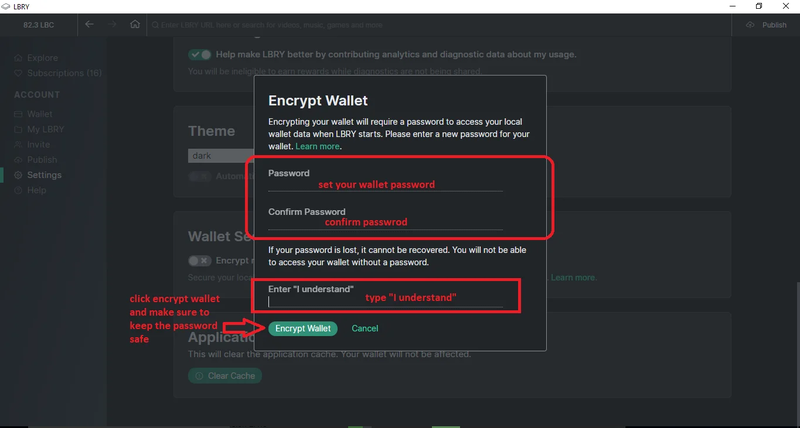 It is important to understand that the wallet is not stored on any LBRY servers and as such, users are responsible for its safeguarding through encryption and making sure a backup (copy of the wallet file) is available in the event that it is lost or corrupted. Encryption is available from the Settings page of the LBRY app and you will be required to enter your password upon app startup. The easiest way to explain encryption is by comparing to a special password that locks and unlocks the contents of a file, and in this case, it's the private data of your wallet. Private keys give you full access to the funds in your wallet and should never be shared with other parties. Encryption provides an additional layer of security in case someone had access to your wallet. By setting a password for your wallet, you are ensuring that only a person with that password will gain access, and no one else. This is why a strong and unique password is highly recommended. Losing this password results in the loss of your funds. Encryption is not required and solely up to the user. We highly recommend it, but this comes with the risk of losing your password which results in the loss of your wallet and its associated funds. If you do proceed, you agree that LBRY is not responsible for losing access to your funds in any way. How do I enable encryption? Encryption can be enabled through the Settings page of the LBRY app. Click the toggle button to begin the process. You will be asked to create a strong wallet password. Enter it twice and confirm your understanding of the warnings. All subsequent LBRY startups will require you to enter this newly created password. Without it, the wallet cannot be accessed. The wallet can also be decrypted (made plain text again) if the setting is disabled. Click the Settings button in the Left Side of the screen. Under the Wallet Security section click toggle button Encrypt my wallet with a custom password. Fill the Encryption Form with your own password and type I understand on the below of the Enter "I understand" section, and then click the Encrypt Wallet button to encrypting your wallet. What about backups I made before encrypting my wallet? These backups are still valid and give full access to your wallet. If you have a secure backup of your encrypted wallet, it is recommended that they are deleted to prevent access by others. Deletion is at your own risk and implies you have a working encrypted backup. I lost access to my password, can you help? As explained above, LBRY does not store your password and cannot help you recover it. By encrypting your wallet, you agreed to these terms.